I offer complete web design solutions and online marketing services to meet YOUR website needs. With over 12 years of professional web design experience, you can rest assured that you will have a visually pleasing and functionality rich site that will be a true asset to your business. Whether you are seeking a basic web site or a more involved site that includes an e-commerce shopping cart or CMS (content management system) - I have a solution for you. I can personally assist you through the entire process of creating a successful website; planning, design, development, hosting and marketing - or jump in where you need me to. Always affordable and scalable service options are sure to help you grow and continue to meet your needs. Newest site launched for Lily & Koi, a Eugene, OR based ecommerce site selling island inspired swim suits and accessories. Check out our affordable e-commerce website packages! Emerge Web Design has been continuing to help Great West build their online presence. Building the new sites for Laminating Supplies and Industrial Ergonomic Machinery and now the ERGOup Office Leg Rest. 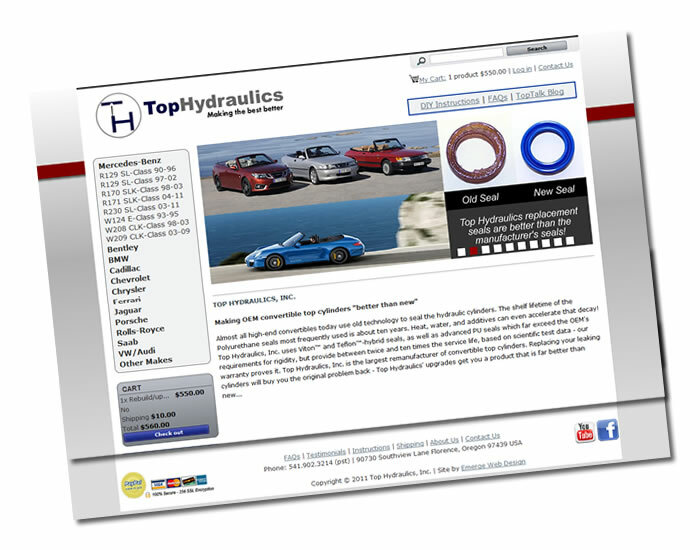 Top Hydraulics Inc. located in Florence, OR provides a unique product and service... repairing hydraulic cylinders for convertible tops. They're new e-commerce website serves a global market and has made it possible to easily manage a large number of orders. Get your business selling online with a new affordable e-commerce web site!